High Hopes at Amoeba. Photo by Ted Friedman. A lot of pieces must line up if Berkeley’s Amoeba, an independent music and video store is to dispense cannabis on Berkeley’s Telegraph Avenue. 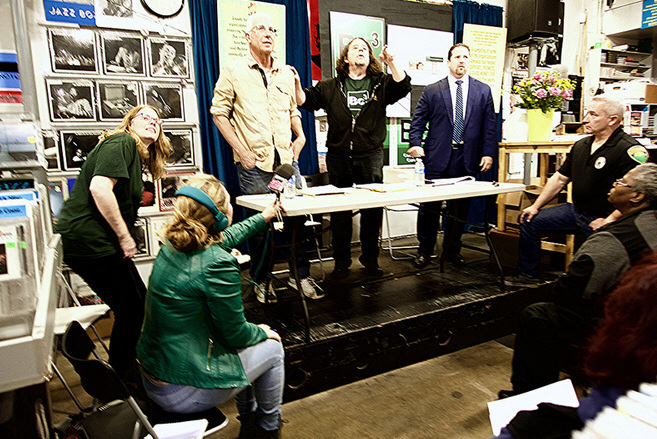 At a formal pot pitch, Thursday evening at Amoeba, Marc Weinstein and his business partner, David Prince traced the Berkeley store’s declining customer base, while boasting of Amoeba’s support for Berkeley causes. As would anyone with a product to sell, Weinstein praised marijuana while pledging to provide the best organic-strains, grown under the best conditions. “We want to improve our world through marijuana,” said Weinstein, a would-be pot entrepreneur. Although a community-serving non-profit, Amoeba’s projected dispensary could earn an estimated $600,000 a month. Much of the profits would be directed to local community groups, according to Amoeba co-owner, Marc Weinstein, who referred to a long list of past Amoeba beneficiary groups. 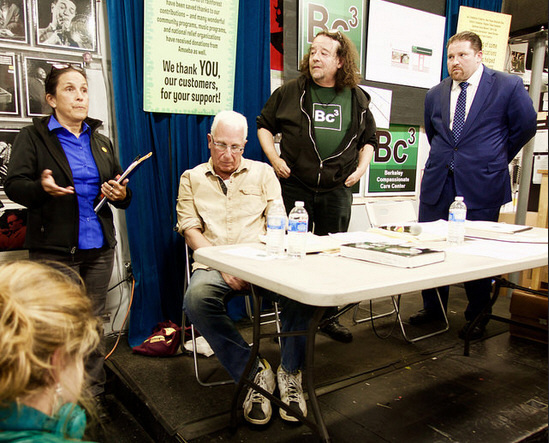 Amoeba’s pot pitch was for the benefit of Elizabeth Greene, a member of the city’s planning commission, who took notes on the pot pitch for the city. She will attend five other would be pot club presentations in the competition for city cannabis sales approval, she said. City Planning Dept. official noting pot pitch. Photo by Ted Friedman. “We have a one in six chance to get a license,” said Weinstein. “We put three and a half years into the planning for this dispensary,” Weinstein added. The planning showed. 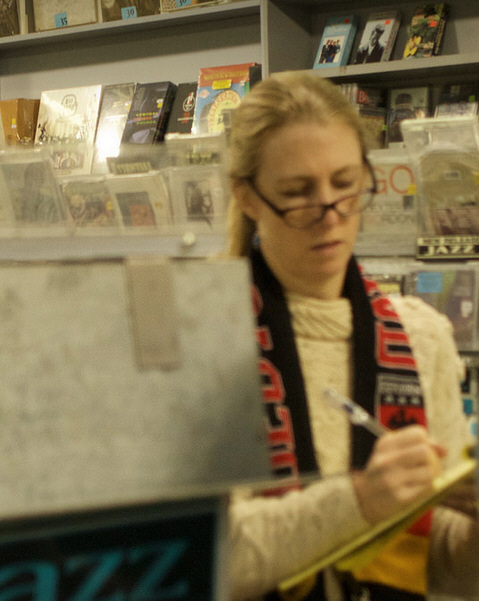 Amoeba has signed on with a labor union to guarantee an $18 minimum wage. The non-profit would hire 40 workers, Weinstein said. Some aspiring hires sought job applications after the presentation. Jen Garcia, left, UFCW rep., David Prince and Marc Weinstein Amoeba owners. Photo by Ted Friedman. Also in place, and presented to thirty-five neighborhood supporters, Thursday, was Amoeba’s pot store manager, with eleven years in “the marijuana industry,” an attorney expert in cannabis laws, and a security firm representative. The security outfit, Golden Valley, has inked a contract with the club. Amoeba pot shop moves closer to approval: Supporters. Photo by Ted Friedman. Praise for Amoeba from the crowd of supporters was effusive. 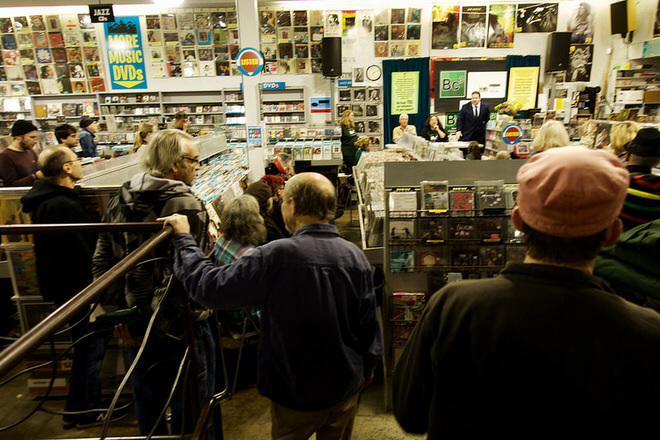 One woman said that Amoeba’s service to the community brought tears to her eyes. The next speaker apologized for not crying. Meanwhile the city planning official was still taking notes. “Five more (presentations) to go,” said the city official. Weinstein said that Amoeba beats the competition because his club has ties to Berkeley, whereas its competitors are not local, Weinstein claimed. Weinstein called the existing pot club, less than three blocks South on Telegraph, “a boutique,” with its mere twelve employees (compared to Amoeba’s projected forty). With a book and music store about to open across the street from Amoeba in direct elbow-to-elbow competition, the pot spot could give Amoeba a revenue advantage over its putative competitor, Rasputin. Located at a once vital commercial hub, the Amoeba Telegraph location has declined, according to Telegraph Avenue businessmen. No one doubts that pot could save the day, or perhaps the perception of that day. This entry was posted on Sunday, November 15th, 2015 at 1:01 pm	and is filed under Telegraph Avenue, The Berkeley Scene. You can follow any responses to this entry through the RSS 2.0 feed. Responses are currently closed, but you can trackback from your own site.